Do you ever find that there is a certain food you love that you can’t keep in the house, because once it’s there in plain sight—staring at you, tempting you—you’ll throw any willpower or sense of portion control out the window and eat the whole thing? I call these danger foods. For my boyfriend, it’s Nutella. For my father, it’s pound cake. For me, it’s fresh ricotta cheese. (And we can add fresh mozzarella, burrata, St. Andre, drunken goat, and Taleggio to that list.) I can’t keep cheese around because I can’t just have one slice. I must have more. I must have it all. But because I’m not a big fan of feeling shame and stomach cramps, I don’t keep it around. I made an exception this weekend and bought a container of freshly made ricotta at Fairway. And though I have at several points this weekend stolen a spoonful from said container, I had enough willpower to set aside plenty of this precious cheese to prepare a recipe I’d been meaning to make for a whole year: Pappardelle with Baby Spinach, Herbs and Ricotta. A photo of this dish graced the cover of the April 2011 issue of Cooking Light, announcing the arrival of spring and a welcome break from root vegetables, casseroles and winter stews. My, did it look pretty! Spring had arrived, and I had fresh ricotta. Time to get cooking. But before I got started, I made a few substitutions. Cooking Light’s recipe calls for fresh dill and chives—lovely herbs, but I associate them more with potato or cucumber salads, not pasta. I elected to use fresh basil and oregano—bright and sweet with some peppery notes. And I kicked up the amount of ricotta from 1/3 cup to a heaping 1/2 cup. Why? Set a large pot of water to boil on the stove; add salt and cover. Cook pasta according to package directions, taking care not to overcook. Once the pasta is finished cooking, set aside about 1 cup of the cooking water before draining. Return pasta to the pot. In a small bowl, whisk together the ricotta with about a 1/2 cup of the cooking water. Add to the pasta. Next, add the chopped herbs and spinach, olive oil, Pecorino, salt and pepper. Toss gently to combine, and add additional cooking water if the mixture is too dry. Divide into 4 bowls and serve immediately. Eat slowly, and savor the start of spring. Pappardelle are wide-ribbon pasta. 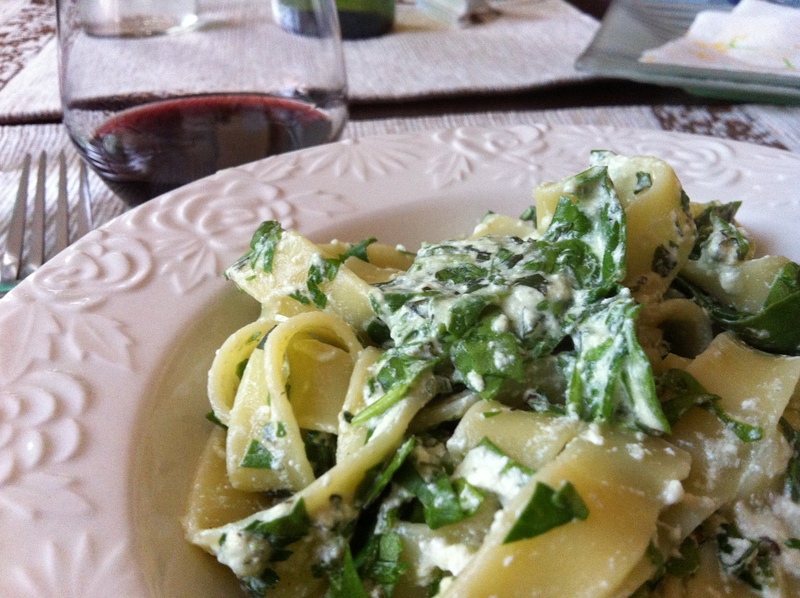 If you can’t find pappardelle, fettuccine works well in this recipe. And though I love fresh pasta, I find dried pasta holds up better here. 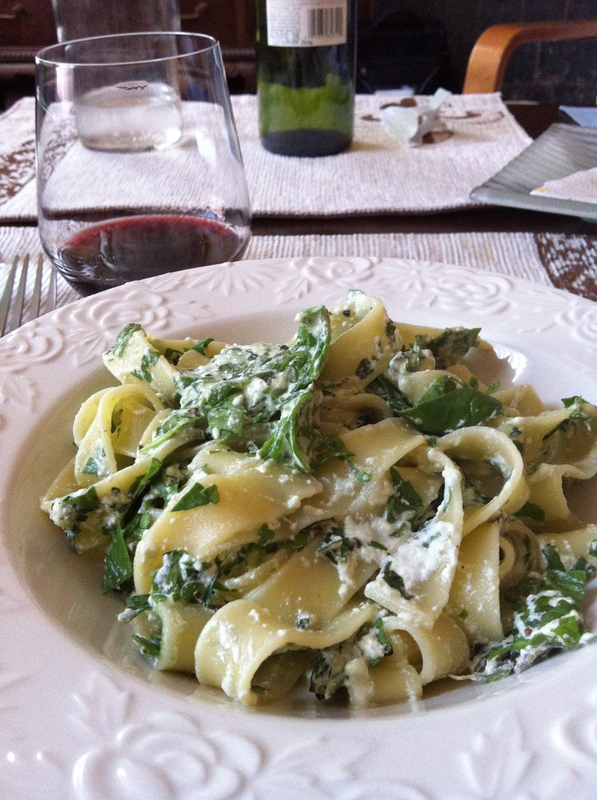 This entry was posted in Recipes, Savory and tagged april 2011, baby spinach, basil, cooking light, fresh herbs, healthy, myrecipes.com, oregano, pappardelle, pasta, photos, points plus, recipes, ricotta, spring recipes, weight watchers. Bookmark the permalink. It looks like spring arrived at your table. I agree about the dill…just doesn’t seem to go with the spinach.